‘A Journey back in time’- English Heritage Roundhouse Presentation - English Heritage is in the process of building a reconstruction of a Bronze Age Roundhouse at Beeston Castle; this informative talk by Carolyn Hicks will take you through the journey as the team try different experimental building methods using tools that may have been used by our ancestors to create a Bronze Age Home. Conversation with Jasper Winn, author of ‘Water Ways’ - Jasper Winn writes about ‘slow adventures’, travelling by foot, bicycle, kayak and horse. Jasper lived for a year with a nomadic Berber tribe in north Africa, worked with cowboys across South America and Australia and sea-kayaked a thousand miles around the Irish coast for his book ‘Paddle’. As writer in residence for the Canal and River Trust he has written Water Ways, about a thousand mile journey along Britain’s canals, exploring their geography, wildlife, history and restoration for modern use. Songs of Summer - Whether you sing in a choir or simply enjoy raising the roof in happy harmony, join us with local choirs making music appropriate for Summer. After the performance we aim to arrange suppers for all who wish to participate at our local hostelries in Bunbury and Cholmondeley. The Oldie Literary Lunch - The Oldie Literary Lunches at Simpson’s-in-the-Strand have become an institution on the London literary scene for the past four years. Now reaching out into the shires, the speakers will stimulate lively discussion and debate at Cholmondeley Castle. After a delicious three course lunch plus wine, three household names will regale the audience with anecdote and wit. Cholmondeley Garden Tour - As Head Gardener at Cholmondeley Castle for the past six years and with more than twenty years horticultural experience, Barry Grain has focussed on the continued evolution of the gardens. Working closely with the Cholmondeley family, Barry has led the creation of the ‘Lavinia Walk’, as well as new developments in the rose, temple and folly gardens. Barry’s widening research last year took him to Sichuan, China. What Makes a Great Gardener? - Stephen Anderton, author of ‘Lives of the Great Gardeners’ attempts to answer this question. Renowned for his weekly Saturday column in The Times, Stephen has twice been awarded Garden Writer of the Year by the Garden Writers Guild. Stephen’s books include Discovering Welsh Gardens (2009), Christopher Lloyd - His Life at Great Dixter (2010) and Lives of the Great Gardeners (2016). A lively evening of folk music with Merry Hell - The band hails from Wigan and is founded on the ever-evolving folk tradition – music made by and shared by the people. Their hearts and souls are tuned to old songs but they bring you new words and music forged from their own experiences and emotions. Concerts always sell out and, once seen, it is easy to understand why. They have been awarded Best Band and Best Live Act by Folking.com. Malpas Writers Group in Conversation - Formed five years ago, the group meets regularly to listen to and appraise different forms of writing by members of the group, including prose, poetry and drama. Performance of pieces written over the past year will feature. The inside secrets of Film Locations by LivLoc (Liverpool Locations) - Sisters, Clare and Faye, run the company, sourcing film locations for Feature Films, TV Dramas, Commercials, Music Videos and Photoshoots. With over 34 years of combined experience filming across the UK and the North West, particularly Liverpool, they have stories to tell. Films include Harry Potter, Film Stars Don’t Die in Liverpool and Sherlock Holmes. Dramas include Peaky Blinders, Hollyoaks and Brideshead Revisited. In Conversation, Brookside Writers - Four writers who have penned multiple episodes of Brookside and won many dramatic and literary awards will stimulate wide-ranging discussion. Jimmy McGovern, Andy Lynch, Jan Needle and John Oakden will disclose their experiences writing this iconic, ground breaking drama. Dance to the Brass Monkees - This electric 9 piece band, featuring a 3 piece brass section bring an action packed, fun-filled combination of Soul, R&B, Funk and Motown. From Stevie Wonder and David Bowie, through to Earth, Wind & Fire and Jackie Wilson, they are sure to give you that feel good factor and pack any dance floor. The Peter Wheeler Short Story Competition - Now in its ninth year, the competition features the writers of the best short stories. Tattenhall Hall garden open - Visit this beautiful 41/2 acregarden surrounding Tattenhall Hall which includes a wild flower meadow, a large pond and stream, walled garden, colour-themed borders and is open under the National Garden Scheme. A Lively and informative literary session based on Paula Sells’ new book, The Tack Room - Paula has spent a lifetime with horses, hunting and Pony Club in Cheshire and reaching the eventing championships at Burghley. Following a career in Immunology at the Liverpool School of Tropical Medicine she practised and taught the ancient art of horse logging and bred thoroughbreds for a family and friends’ racing syndicate and works with Riding for the Disabled. A Beginner’s Guide to Opera - An evening providing a light-hearted introduction to the evolution of opera from Handel through to Puccini and beyond. Four young professional opera singers and a pianist present arias and duets, both familiar and lesser known, aiming to give the audience a well-rounded overview of opera in the shortest possible time. Breathtaking views and a superb setting provide the backdrop to a very special Art Exhibition. All paintings and sculptures are available for purchase. The works of many talented artists (all linked to Cheshire) are fascinating, diverse and of the highest quality. Wander and browse whilst enjoying the art and the scenery of Cheshire at the heart of the Sandstone Trail. 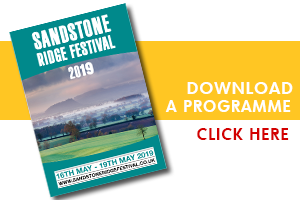 The Sandstone Ridge Festival is an arts and community festival celebrating Cheshire’s artists and performers, with music, theatre, art exhibitions, author talks and poetry.